Seven Myanmar soldiers have each been sentenced to 10 years in prison Tuesday for "contributing and participating in murder" of 10 Rohingya Muslim men last year. Four officers and three non-officers were convicted in the ruling. The 10 victims were reportedly hacked to death and buried in a mass grave in the northwestern state of Rakhine in September. The Myanmar military admitted to the killings in January, marking the first time the government took responsibility for the mass killing of Rohingya people, an ethnic minority in the country who human rights groups and the United Nations say are victims of an ongoing genocide. 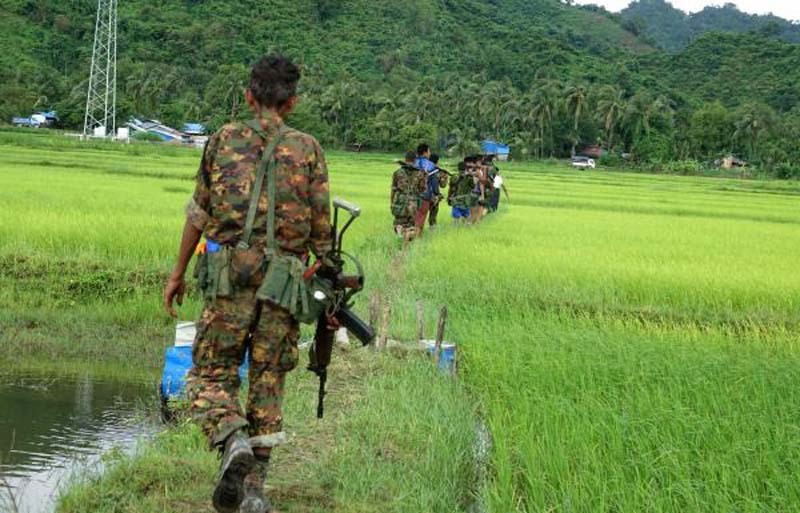 The Myanmar government denies the accusations of genocide and said accused the 10 victims of being "Bengali terrorists" who attacked soldiers first. Witnesses disputed that account and said soldiers came into the village of Inn Dinn and carried out a massacre and piling bodies in mass graves around the area. The Myanmar military admitted to the killings after two Reuters journalists -- Wa Lone, 31, and Kyaw Soe Oo, 27 -- were arrested in December while investigating reports of mass killings in Rakhine. Both journalists are still detained on charges of violating the country's Official Secrets Act for allegedly obtaining secret government documents.